UK company Popularchitecture is proposing to house all of the folks who will be moving to London town in the next eight years - all one million of them - in a single building. 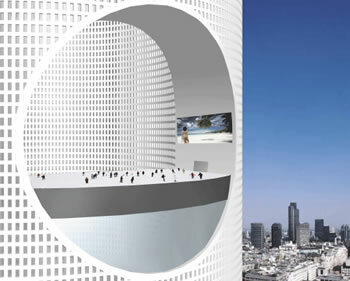 This fanciful tower has an empty core space, to provide more light for the interior spaces. There are many advantages to housing a large number of people in a relatively small space; far less energy is needed in every aspect of life. American suburbs, by contrast, are built with the assumption that energy will always be a negligible cost. The London supertower is just a fictional exercise at present - and I think if you're going to make something up, you should go to the guys who are good at it. In this case, read about the arcology in Oath of Fealty; Jerry Pournelle and Larry Niven did a great job of imagining a building two miles on a side. They didn't dream up the idea of an arcology, but they really brought one to life. 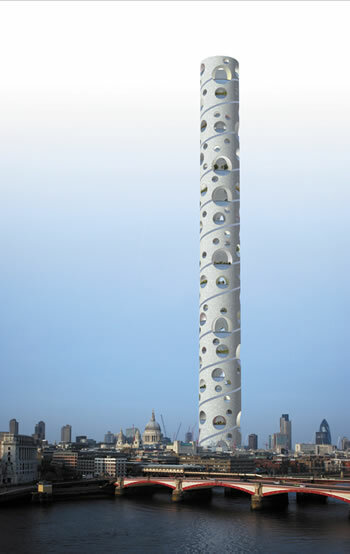 Via io9 and Popularchitecture Supertower.